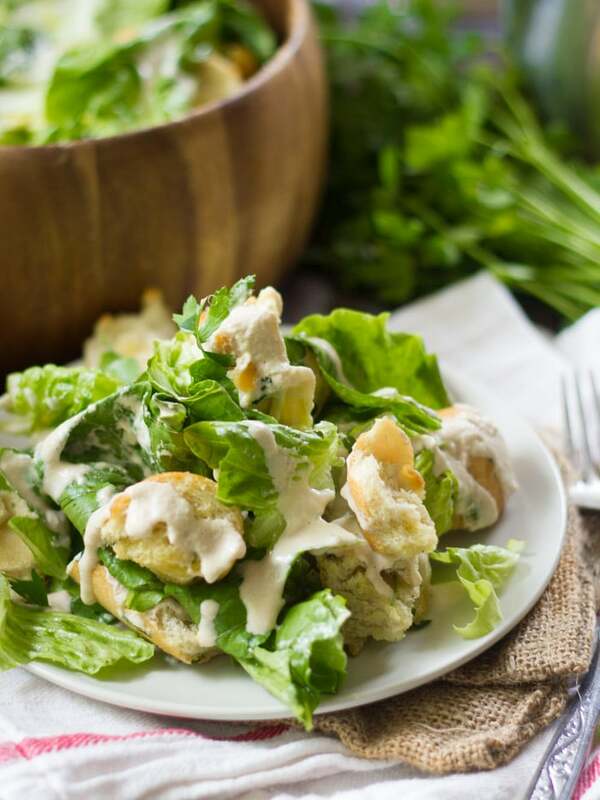 This vegan Caesar salad is made with crisp romaine lettuce, garlicky baked croutons and to-die-for rich and creamy cashew-based dressing. Rich, indulgent, and full of flavor. You won’t miss the dairy in this one! I hope you guys like cashews! Actually, it probably doesn’t matter. This vegan Caesar salad doesn’t taste like cashews, but they’re in there. Actually, come to think of it, they’re in all this week’s recipes. Cashew cheese, cashew sour cream, and now cashew Caesar dressing. I mention it just because I tend to feel a little weird when I hit an ingredient repeatedly like this, but then again, I didn’t even realize I was doing it with cashews until I sat down to write up the recipe, which, I believe, just supports my hypothesis that none of this stuff tastes like cashews. I’ve visited cashews-a-many on this blog, and I’ve actually done a few spins on Caesar salad-themed stuff too, but they were just that, spins. Caesar sandwich. Caesar salad with tempeh. How about a classic vegan Caesar salad? I’ve had requests, so I figured it was about time. I’m always tempted to put crazy spins on things, but sometimes the classics are just that because they’re great, and I think that may be the case with Caesar salads…you know, except for the whole dairy and anchovy part. Maybe slightly modified classics are the best. 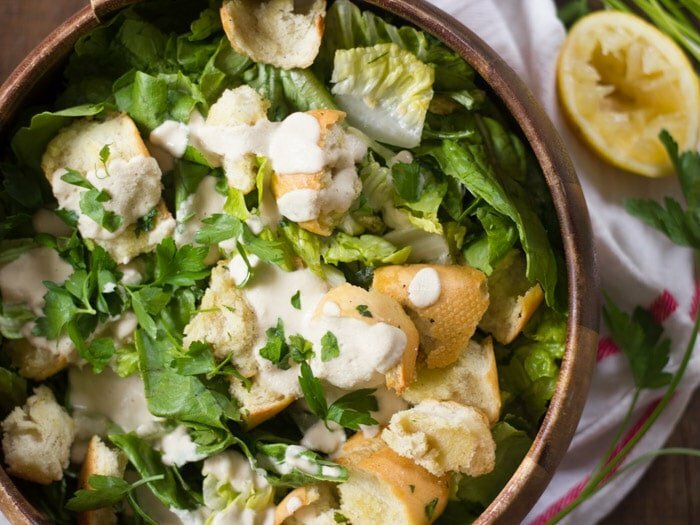 I thought about just sharing a recipe for vegan Caesar dressing, but opted to include the whole shebang, mainly because the croutons are so key. Make a double batch of croutons because you will snack on most of them. This salad comes together super easy. Soak the cashews in water to soften them up, then blend them up with garlic, water, and a handful of other seasonings. Miso is the key to getting that salty, savory, classic Caesar salad flavor without anchovies. You’ll make the croutons by tossing some bread cubes in a mix of garlic and olive oil, and then baking. Toss your homemade croutons and dressing with some crispy romaine lettuce, and your vegan Caesar salad is ready. Dig in! Don’t forget to soak your cashews! But if you forget, don’t worry! Boiling them for 15 minutes works in a pinch. 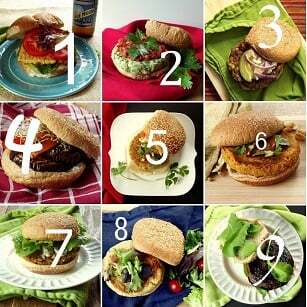 The dressing will keep in the refrigerator for about 4 days, or in the freezer for 2-3 months. You can easily turn this salad into a meal by adding some protein: try chickpeas, baked tofu, or (my favorite) the blackened tempeh from this recipe. 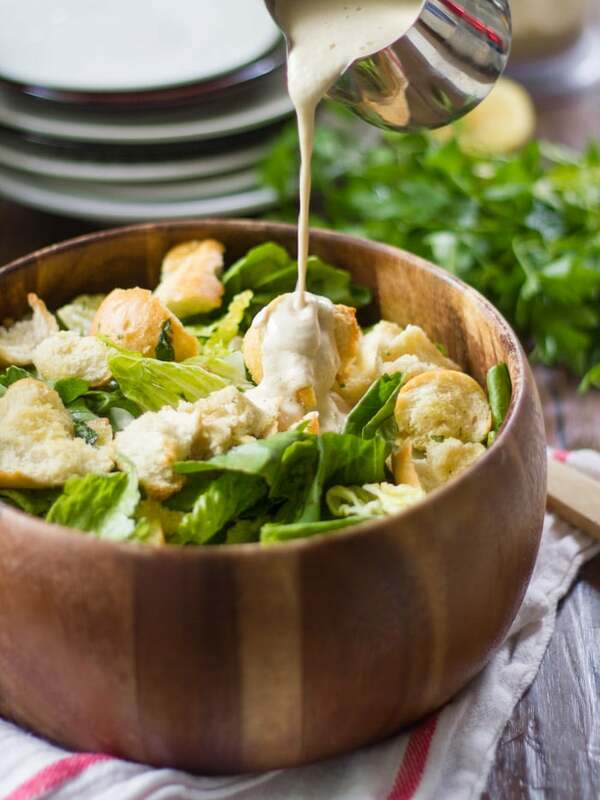 This vegan Caesar salad is made with crisp romaine lettuce, garlicky baked croutons and to-die-for rich and creamy cashew-based dressing. Rich, indulgent, and full of flavor. You won't miss the dairy in this one! Stir the olive oil and garlic together in a small bowl. Place the bread pieces into a large bowl and add olive oil mixture. Toss to coat. Arrange the bread pieces on a baking sheet and sprinkle with salt and pepper to taste. Bake until the bread pieces begin to brown and crisp-up, 12-14 minutes. Remove the baking sheet from the oven and transfer to a cooling rack to cool. While croutons bake, place all dressing ingredients into a food processor or blender, staring with 3/4 cup of water. Blend until smooth, stopping to scrape down sides of bowl or pitcher as needed. Thin with additional water as needed, and season with salt to taste. Place lettuce and croutons into a large bowl. Add dressing, a bit at a time, and toss to coat. Sprinkle with parsley and vegan Parmesan cheese, if using. Use as much dressing as you like. Save the leftovers for future salads, use as a dip, or stick it in an airtight container and freeze. Hi Alissa, how much cashew butter would you use when subbing that for the raw cashews? Thanks! I can’t find Miso paste in any store near me. Is there anything I can use to substitute for it? Glad you liked it! Thanks Emily! Caesar salad was my favorite before going vegan. Im so glad I finally found a vegan version! This is delicious! Such a great dressing. I can’t stop eating it and love it as a dip for veggies also. The Worcestershire sauce really kicks it up and I love that it’s not mayonnaise based and contains healthy miso. My 10-year-old daughter and her friend think it’s amazing too! I’m so happy to hear that it’s a hit!! Thanks so much Heidi!